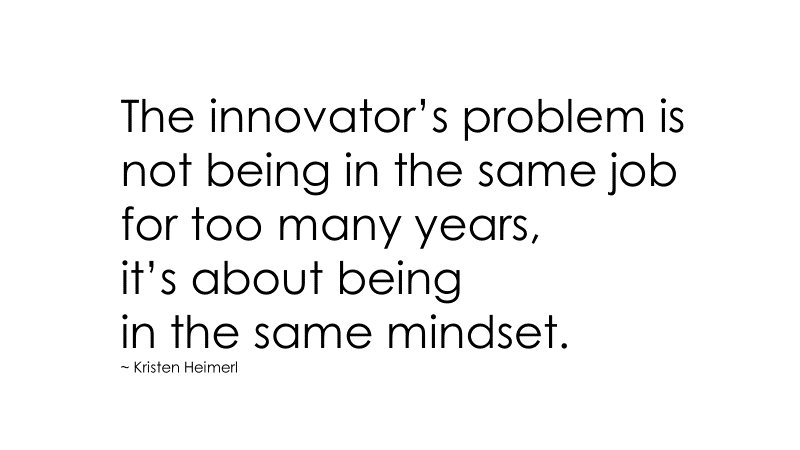 I’ve irked more than a few people over the years sharing my views on innovation. Specifically, that if we could simply remove our “industry blinders” that prevent us from seeing the world untainted by our experiences and built-up perspectives, disruption shouldn’t occur—i.e., that all innovation builds on prior innovations. It doesn’t drop from out of nowhere, like a meteor. The strange and beautiful truth about the adjacent possible is that its boundaries grow as you explore those boundaries. Each new combination ushers new combinations into the adjacent possible. Think of it as a house that magically expands with each door you open. You begin in a room with four doors, each leading to a new room that you haven’t visited yet. Those four rooms are the adjacent possible. But once you open one of those doors and stroll into that room, three new doors appear, each leading to a brand-new room that you couldn’t have reached from your original starting point. Our “industry blinders” often prevent us from seeing the doors, or the adjacent possible that presents itself. But others, often outside your industry, see the door, open it, and drive breakthrough innovation. Of course, I loved this book because now I can speak about a topic I am passionate about without clearing out the cocktail party. But Where Good Ideas Come From is so much more than a single powerful concept; it contains many powerful ideas—all of which support his premise that it is context—environment—that either nurtures or hinders the growth of good ideas. To make your mind more innovative, according to Johnson, you have to place it inside environments with rich networks of ideas and people that encourage the exploration of the adjacent possible—of boundary-busting and making new connections and associations. The Slow Hunch: Breakthrough ideas generally evolve over time as slow hunches rather than sudden discoveries. Throughout history big thinkers captured their ideas—i.e., they “facilitated reflexive thought”—in what today we could call a journal. From John Locke, to John Bell and Charles Darwin, each documented their work, findings, and interesting tidbits over a lifetime. It was this activity that enabled them to nurture their ideas and make connections among seemingly disconnected things that, ultimately, drove their greatest work and achievements. John Locke called his journal “The Commonplace Book;” Darwin referred to his grandfather’s notations as “The Great Book.” Call it what you want, it works. Internet → HTML → HTTP → TCP → etc. Another classic example is The Global Positioning System (GPS) that moved from military use to commercial use in the form of trackers to location-based services. The web is a platform, Twitter is a platform. Platforms stack on top of other platforms spawning innovation after innovation. New Ideas Build On Old Ones: There’s plenty of innovation to be had by repurposing old ideas in new ways. Think about the Internet: it was built for scholarly use but, of course, it’s transformational powers truly came into play when it was applied for our commercial and personal use—e.g., for shopping, social networking and more. Back to Networks: Large Networks Trump Small Ones: It’s no surprise that more innovation occurs in big cities than rural communities and in co-working spaces than in solo home offices. More people + more ideas translates into more opportunities for collaboration and more opportunities for ideas to collide. 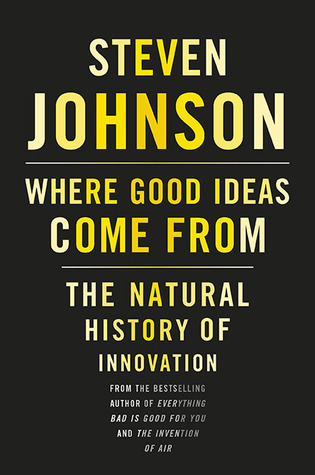 As the capstone to his book, Johnson addresses networks again by classifying specific ideas or innovations over several hundred years into four broad quadrants to answer one question: What kind of environments make innovation possible in the first place? To execute his analyses, Johnson places each innovation/idea on an XY grid where an idea is either generated by an individual or a network of individuals (the X axis) and/or a commercial or non-commercial environment (the Y Axis). 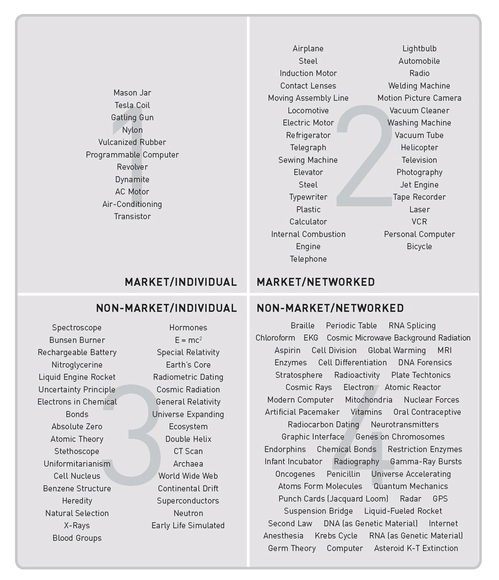 What the classification reveals is intriguing: early innovation (from 1400 to 1600) occurs largely in environments characterized as “non-market/individual” (quadrant three)—which makes total sense because information networks were undeveloped, slow and unreliable at the time. Solo, amateur innovation (quadrant three) surrenders much of its lead to the rising power of networks and commerce (quadrant four.) Also, notice the dramatic concentration of ideas on the right-hand side of the grid. This reflects the rise of networked innovation over individual innovation that characterized centuries past. Keep in mind this book is about how good ideas get created, and the visual above helps to tell that story. For those who geek-out on history, the book has a lengthy appendix that chronicles key innovations from 1400 to 2000. There’s also a supplemental reading list for each chapter to enhance your learning and perspective.